Description: The John Hancock Center on North Michigan Avenue looks on at the left. #52 is the "State of Illinois". 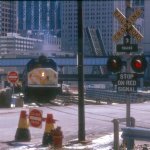 Description: MILW F40C 52 at Western Avenue in Chicago, Illinois on an unknown day in Octomber 1979, Kodachrome by Chuck Zeiler.